Ashlee Simpson and Pete Wentz unveiled a pic of their new adorable bundle of joy Bronx Mowgli. The Wentz's talked about the reason they chose the unusual name for their son wh is destined to be a politician or a rock star. The proud pop explained the decision, with US noting that his goal was to make sure his kid would have a moniker that would work as either 'a rock star or a senator.'" Pete Wentz and Ashlee Simpson tried to pimp their baby pics but couldn't find a buyer so they decided to post tme online for free. We heard that Ashlee Simpson's manager dad (Joe Simpson) was trying to get big bucks for his daughter and Pete Wentz's baby's first photos. Finally, unable to sell their baby's photos to OK!, People, Us Weekly or even Parade or AARP, the couple gave up and posted a pic of their bundle of joy online. 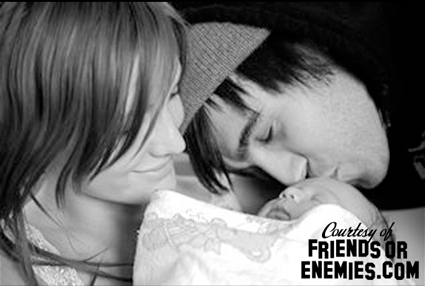 "We decided to share the best gift we could ever receive with you: Bronx Mowgli Wentz. We couldn't be happier," they wrote in a post on the Fall Out Boy's blog FriendsorEnemies.com. We know why Papa Joe performed the wedding. He wanted to make sure Pete Wentz didn't run away from the Ashley Simpson wedding deal. People confirmed that Ashlee Simpson is knocked up and expecting her first child. At Jessica Simpson's wedding to former boy band singer Nick Lachey Papa Joe made sure the Reverend gave the speech about how Jessica Simpson was wearing her white wedding dress because she was an innocent virgin. Poor Papa Joe couldn't give the same speech at Ashlee Simpson's wedding because she's preggers. Don't be sad for the Simpson clan because there are rumors that a sequel to the MTV hit Newlyweds starring Ashlee Simpson and her new husband Pete Wentz is already in the works. Ashlee Simpson has been denying rumors of a Newlyweds spin off series. However, Pete Wentz also denied the couple was having a shotgun wedding because Ashlee Simpson was pregnant. We wonder how long this marriage is going to last? Nick and Jessica announced they were getting divorced shortly after newlyweds went off the air. Nick Lachey and Jessica Simpson were married for three years. Our guess is that they'll stay married as long as the checks keep rolling in to them. Jessica Simpson secured several lucrative multi million dollar endorsement deals as a result of her Newlyweds fame as the "dumb blonde" during their short marriage. In their first months of marriage, they opened their lives to the ever-vigilant cameras of MTV, in the ever-prurient milieu that is reality television, and they did so to promote their pop albums, a strategy that actually worked, but only because it turned them into cartoons -- him the eye-rolling everyman, she the fuckable ditz -- and if they hadn't made that choice, if they hadn't been such eager strivers, so ready to talk about their "farting contests" and their "toe jam" on television, then maybe we'd feel a little less invested in the story. But they invited us to the party. And they can't ask us to go home now. Not when the party has started to heat up. Ashlee Simpson and Pete Wentz were married Saturday evening in an intimate ceremony, their spokesperson tells PEOPLE exclusively. "We're delighted to confirm that Pete Wentz and Ashlee Simpson were married this evening in front of family and close friends," said the spokesperson. Simpson, 23, wore an ivory lace wedding gown by Monique Lhuillier accessorized with a diamond necklace and earrings by Neil Lane as she and Wentz, 28, exchanged vows in front of 150 guests at her parents' Los Angeles area home. Dad Joe Simpson performed the non-denominational ceremony, while sister Jessica served as maid of honor. Wentz's English bulldog, Hemingway, was the ring-bearer. Guests included Jessica's boyfriend, Dallas Cowboys quarterback Tony Romo, Nicole Richie and Joel Madden, as well as actor Donald Faison with girlfriend CaCee Cobb. With the help of wedding planner Mindy Weiss, Simpson got her dream nuptials: The Alice in Wonderland themed reception featured a wedding cake by Sam Godfrey of Perfect Endings with a top hat, tea pot, stop watch and a pot of flowers on top. The elaborate centerpieces of black beauty roses were by Mark's Garden. Guests were served Rose Veuve Clicquot champagne followed by a sit-down dinner and dancing to a deejay. Simpson, who is pregnant with the couple's first child, and Wentz, the bassist for Fall Out Boy, have been linked since the fall of 2006, when they were spotted kissing at a New York nightclub. They announced their engagement last month. ASHLEE SIMPSON PREGNANT MARRYING PETE WENTZ? People are starting to wonder if Ashlee Simpson is marrying Pete Wentz because she is knocked up. Us Magazine revealed exclusive news that Ashlee SImpson is pregnant. The baby's father is Ashlee's fiance Fall Out boy band member Pete Wentz . We don't know if the information is true about the couple having a baby. However, Ashlee and Pete did a blog spoof of Brad Pitt and Angelina Jolie pretending that Ashlee was having a baby. Watch the video of Ashlee Simpson and Pete Wentz getting on the celebrity baby making band wagon. Maybe there is a MTV reality show in the works to bring some money to the Simpsons clan. Joe Simpson scored reality shows for Ashlee and his daughter Jessica Simpson's show. Newlyweds with her Jessica Simpsons ex-boy band singer husband Nick Lachey was a hit. UPDATE: According to MTV news Pete Wentz is denying that Ashlee is pregnant. In an e-mail to MTV News, he denied reports that that surfaced Monday (April 14) on the Web sites of OK! magazine and Us Weekly that he and Simpson, 23, and Wentz, 28, are expecting their first child. "There is a witch hunt for people to be pregnant whenever they get engaged in Hollywood," he wrote. "This is all news to me. I can't wait for the story about how I'm really in a gay relationship and this is all just a cover. ... I mean really, this is crazy. ... I mean we're engaged, that's true, and happy about it." Ashlee Simpson is pregnant, a source confirmed to Usmagazine.com. The singer, 23, is expecting her first child with fiancé Pete Wentz, 28. "We are thrilled to confirm their engagement and congratulate this happy couple," a spokesperson for the couple told Us. "Beyond that there is nothing to say." Blogger Perez Hilton set the rumor mill in motion that Ashlee Simpson was drunk after her March 4th appearance on D.C. radio station Hot 99.5 Kane in the Morning show. A representative for the star released a statment on March 4th saying, "Ashlee was absolutely not intoxicated this morning on Hot 99.5. "She has been working extremely hard traveling across the country to promote her upcoming new album by performing at night and waking up very early the next day to do radio interviews in the morning -- like any of us would be -- she was simply just tired." LISTEN TO THE RADIO INTERVIEW ASHLEE SIMPSON TALKS ABOUT HER NEW FLOWER TATTOO. Ashlee wrote the following entry on her myspace blog to clear up the rumors. I'm sitting on my bus heading to Tampa, FL. I have been on a promo tour. It has been a crazy hectic schedule. Early mornings for radio and late nights playing club shows. It's been a lot of work, but I have great people with me so it's been a lot of fun! :) I just wanted to address the rumors from a couple days ago at a morning radio show. It was very upsetting to hear that people are saying that I was intoxicated when I came in for my morning interview. I take my work very seriously and would never disrespect anyone and come into an interview that way. Here is the honest to God truth and this is for none other then my fans: The night before I had a good friend come to my hotel to give me a tattoo. When I arrived to the radio station I showed them the tattoo I got the night before. It is my belief that they automatically assumed that because I got a tattoo I must have drank that night. I would never get a tattoo after drinking nor would a reputable tattoo artist do a tattoo after someone was drinking. When I walked into the radio station I was thrown into the interview. They didn't even introduce themselves to me before starting it, and just put me on the air. I felt bad energy and like I was about to be attacked as soon as I sat down. I felt uncomfortable. I'm sure you all have heard the interview so there is no need for me to sit here & tell you everything that was said and asked. As you may have noticed, I was asked mostly personal questions which are never fun to be asked and therefore I giggled my way through it. If you listen to other interviews I've done, you'd know I giggle a lot. Not only because I am a happy person & everyone who knows me knows I laugh all day long, but also I giggle when people ask me uncomfrotable questions not knowing what to say or what else to do. Questions & false rumors about my dad being a jerk, being pregnant, being engaged, etc are not fun to answer every single day. Eventually I try to just laugh them off and hope they start asking me important questions about my album and music which is why I am there. Five minutes after the interview was over I heard the dj that interviewed me say on the air that I was drunk. That really upset me especially after how uncomfortable they made me feel. Twenty minutes after that I went to XM Radio for an interview. They treated me with respect and were thankful for me showing up so early in the morning. I told the DJ there what had just happened and he said he wasn't surprised at all. The XM DJ said he used to work at that radio station and that he does things like that to people all the time trying to make a "story" out of it. He hated it because he did things like that to people all the time. Throughout my career, I have learned that you must speak up for yourself when people try to put you down. That is why I am writing this today. I'm tired of people making things up about others. Again, this is for my fans. You are what is important to me.